It's beer time! Here are the favourites of The World's 50 Best Bars in day 11 of the Brands Report. For many elite bartenders, beer and water are probably not top of their list of priorities, but they are the bare necessities for any bar and, let’s face it, there are good margins to be had, particularly on water. On the beer front, the surprises are how low Heineken comes in trending and yet it reigns supreme as the world’s most consistent premium beer, except possibly in the UK for historical reasons. Stella Artois, on the other hand, is well down on established, existing brands, which is what you would expect for an essentially pub brand, yet it is a staggering number three in trending. 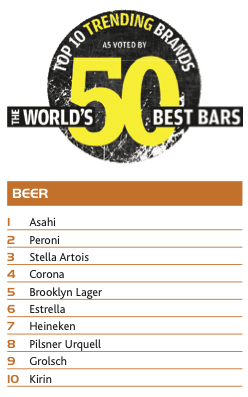 Both Peroni from Italy and Brooklyn are pretty consistent, while Japan’s Asahi is near the top on actuals and at the top on trending. Nice positioning. Corona Extra, that old Mexican favourite, is nowhere in the real time list, but pops in at number four on the list of up-and-comers. Could this be comeback-time for beers with a slice of lemon or lime shoved in the neck to give them flavour? When it comes to water, the likes of San Pellegrino, Perrier and Evian lead the pack, which is totally understandable as these are the brands that created and defined. There was a time, certainly in the UK, when ‘Perrier’ was the generic term for a bottle of water and there are a huge swathe of people who have a lot of affection for the brand that ‘broke’ the bottled water market. Brands such as San Pellegrino, Evian and Badoit have been huge forever in their respective locales but, as the demand to be seen drinking bottle water has ramped up, these were the brands that were there with their taps on. Now it is drop dead cool to be seen routinely walking around with a branded bottle of water in your hand. Since we relaunched the World’s 50 Best Bars, we think we’ve built up a pretty fantastic list of top bars and phenomenal bartenders from all over the world. It’s still growing, make no mistake – and we feel really quite excited about it. So excited in fact, that this year we decided to reinvent the way we conduct the artist formerly known as Hot Bar Brands by polling our very own top 50.